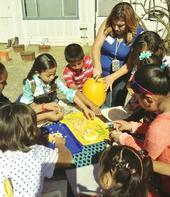 UC ANR nutrition educator teaches the Plan, Shop, Save & Cook curriculum. Celebrities have taken the “food stamp challenge,” trying to feed themselves on a budget equivalent to federal food benefits for the poor. Most have failed, but UC Agriculture and Natural Resources (UC ANR) has found a way to help low-income families successfully stretch their food dollars and eat healthier while receiving food assistance. School chefs are adding more fresh fruits and vegetables to their menus. You can lead a child to fresh fruits and vegetables, but how do you entice them to eat healthful foods when you aren't watching? “Simply offering healthy options is not enough to motivate children to make healthy choices,” said Sheri Zidenberg-Cherr, UC Cooperative Extension specialist in the Department of Nutrition at UC Davis. “Moreover, imposing restrictions rather than providing children with options to make healthy choices can have long-term negative effects,” said Rachel Scherr, assistant project scientist, also in the UC Davis Department of Nutrition.